The wind and the chill has been a challenge. But for those that do accept the a little chill in the air, the reward is great. I talked with Gene St Denis last week. Gene said they had three fish on that were so big, they could not land them. Average mackinaw have been 2 to 5 pounds. 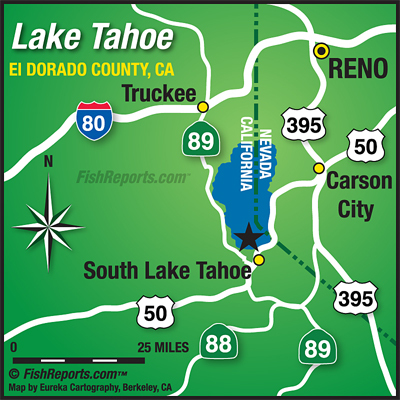 Best areas have been on the north end of the lake from Tahoe City going east to Carnelian bay. 150 feet to 220 feet of water. I do recommend getting on the lake as early as possible. The winds come up about 11 am and navigation can be tricky on Lake Tahoe. Flashers and live minnows have been most productive. Special note, only minnow caught on the lake can be used for fishing. They can not be transported from another body of water. Most anglers use a minnow trap with either a can of either cat or dog food in it. Drop your trap around the rocky areas with a float. For more information or to get a fishing gift card ( which makes a great stocking stuffer) call Blue Ribbon Fishing Charters at 530-544-6552.